For almost 1,000 years the rejection of Gods most holy will and the rejection of God Himself has been escalating. In 1054 A.D. the Orthodox schism started when they said “yes” to God, “yes” to Christ, “yes” to His Church, but “no” to the Pope  the Vicar of Jesus Christ. They do recognize him as “first among equals”, but do not recognize his primacy of jurisdiction over all the Patriarchs, Cardinals, and bishops of the Church. In 1517 Martin Luther said “yes” to God, “yes” to Christ, “no” to the Catholic Church and “no” to the Pope. He claimed to have fidelity to God and Our Lord, but rejected the Church. Yet, it is impossible to remain faithful to Christ while rejecting His Bride, the Church. In 1717 Freemasonry said “yes” to God, “no” to Christ, “no” to the Catholic Church and “no” to the Pope. They claimed to acknowledge God (not the true God, but their own conception of God), but no longer wanted Christ and His Church. Again, it is impossible to serve God while rejecting His Son: “I and the Father are one,” Our Lord said. Finally, in 1917 Lenin said “no” to God, Christ, the Catholic Church and the Pope. With communism, we see the culmination of what was begun with the Orthodox schism and the Lutheran heresy: the bold rejection of not only the Catholic Church, but also the rejection of Jesus Christ and even the very notion of an Almighty God. The Consecration of Russia will reverse the upheaval and revolt against God begun by the Orthodox schism of 1054, furthered by Luthers heresy of sola scriptura, added to by the apostasy of Freemasonry and intensified by Communism. It is these “No’s” that will be reversed by the consecration of Russia. As Our Lord said, the Church is His bride. You find that in Ephesians. We cant be for Christ and against His Church as Luther taught. We cant be for God and against Christ. As Our Lord said to the Pharisees: “If God was your Father, you would accept Me because I am the image of My Father. I and the Father are One. No, your father is the devil.” God the Son is the image of the Father. “Philip. Do you not know I and the Father are One? You have seen Me, you have seen the Father.” And so in a certain sense, Marx was just fulfilling, by saying “No” to God, the logic thats inherent in “No” to Christ, “No” to His Church and “No” to His Vicar on earth. But all of these things will be reversed by the consecration and the conversion of Russia. Even the “No” of the Orthodox, denying the Papal Primacy in 1054 A.D., will be reversed. Speaking of Our Lady, Saint Bernard tells us, “There are many things imperfect in our offerings to God that She will make acceptable to Him.” St. Alphonsus Liguori explains that if we want our gift to be received by Almighty God, we should offer it through the Blessed Virgin Mary. ” The peace of the world, we are told in the Fatima Message, depends upon the Pope and the worlds bishops obeying the request for the Consecration of Russia to the Immaculate Heart of Mary. It cannot and will not come about through any other means. 3. 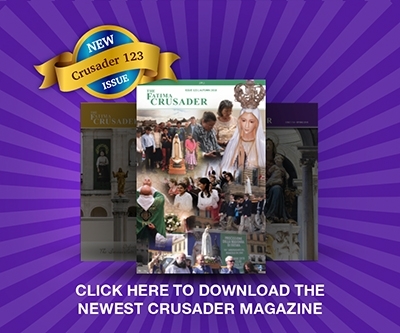 Father Nicholas Gruner, “Do Not Despise Prophecy“, The Fatima Crusader, Issue 54, Winter 1997, pp. 3ff.